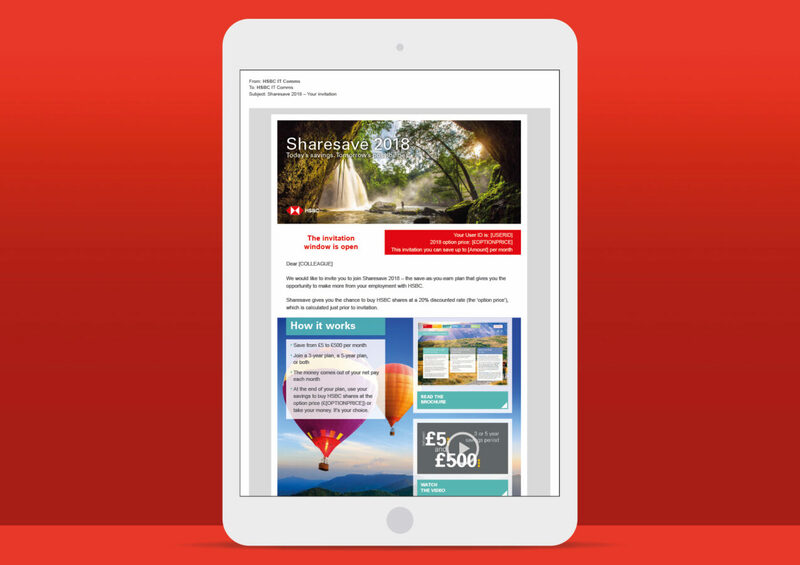 Stitch has been working with HSBC on their Sharesave communications since 2016. They came to us because of our talent for creating clear and engaging share plan messaging. 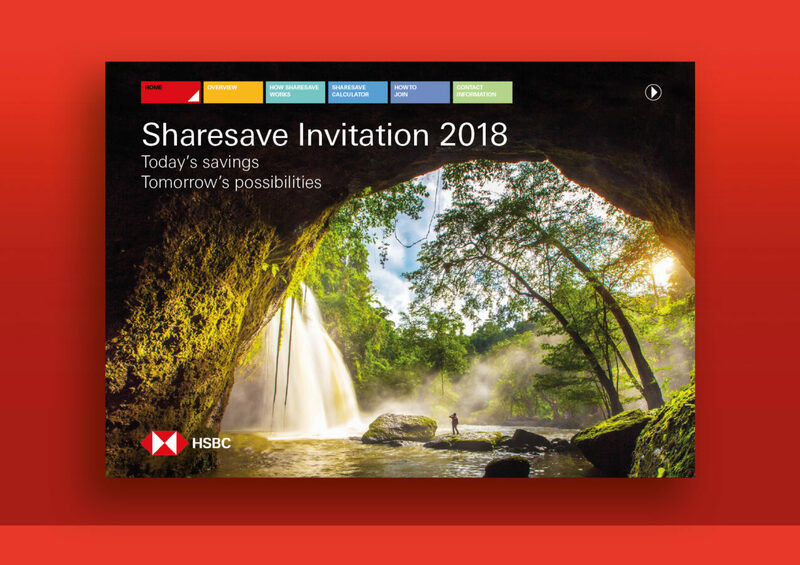 The Brief: HSBC asked us to create new communications for their Sharesave maturity to fall in line with the Sharesave invitation messaging we had put together for them in 2016. The new content and design needed to align with the original concept of “today’s savings, tomorrow’s possibilities”. They also wanted us to produce a specific financial education page and update materials for new invitations to join up in September 2018. The Challenge: With a culturally diverse and internationally dispersed workforce, HSBC face many employee share plan management and internal communications issues. Their staff number is in excess of 250,000 in over 4,400 offices in 71 countries, so finding a way to engage all their employees with one simple message is always going to be a challenge. 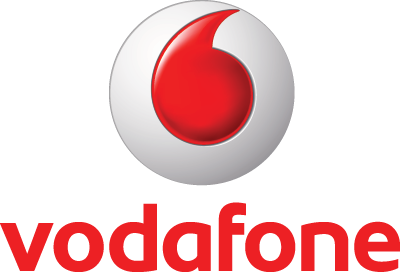 We needed to develop a way to creatively reposition the plan communications which would put the employees at the centre of the experience and make it easy to understand. 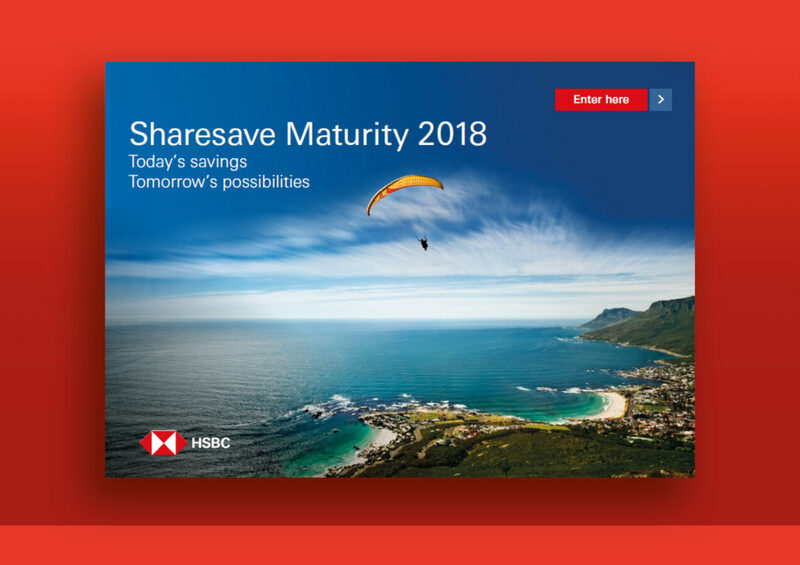 The Solution: The previous Sharesave maturity brochure that HSBC had produced for their employees ran across 11 pages and was extremely word heavy. It was crucial that we started by stripping the content back to the basics and set key learning objectives for both the maturity and invitation communications. 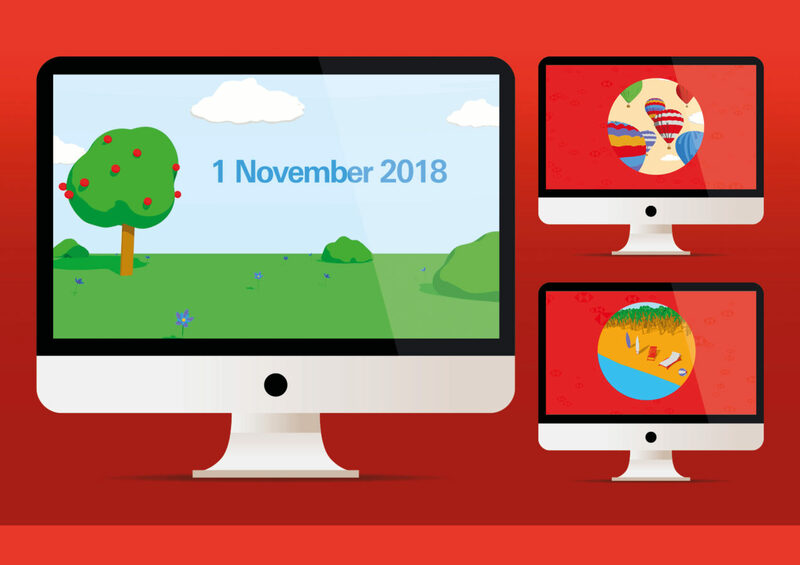 Having previously created the concept and strapline “today’s savings, tomorrow’s possibilities” we updated the Sharesave invitation materials with new images in keeping with this message. 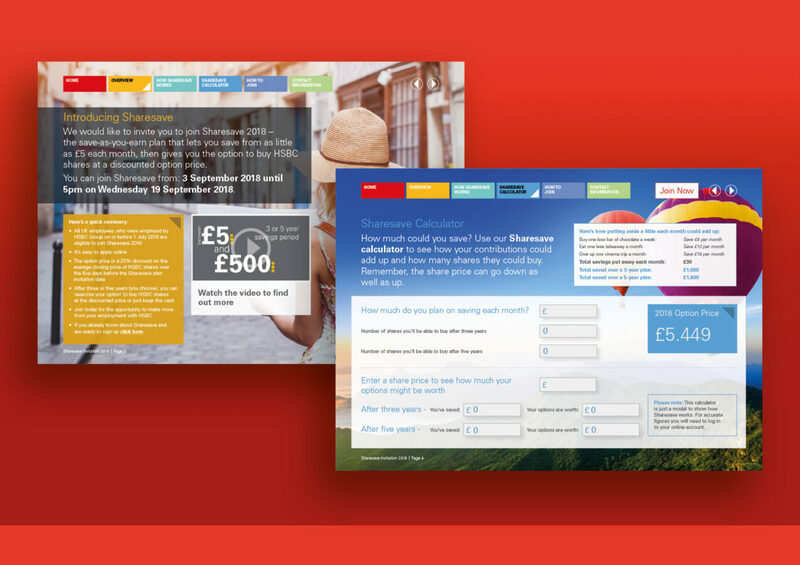 Aspirational yet achievable goals were used in the visuals in order to spark interest from employees; holidays, hot air balloon rides and home improvements. Words were pared back in exchange for an animation and calculator. The Sharesave maturity communications followed a similar visual theme and kept the same concept and strapline. We broke up the text with bright colours and imagery, allowing us to include lots of content without overwhelming the reader. This brochure also included animation and a calculator indicating the estimated value of the employee’s shares now that they had reached maturity. 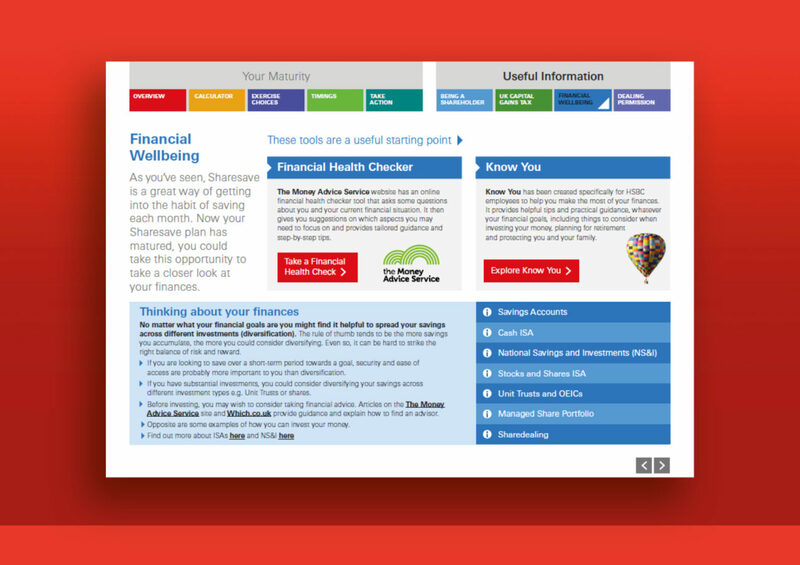 HSBC also requested that a financial education page be included in the brochure, something we hadn’t been asked to include before. This set out key information around financial wellbeing and presented a range of options for the employee to consider now that their shares were vesting. Outcome: Now that both the Sharesave invitation and maturity communications are aligned, a more consistent and identifiable message is being sent to employees. The specifics of the plan are set out clearly and in an engaging manner with a more digital feel. There was a 63% take up in HSBC’s 2018 Sharesave plan which was an increase on the previous year. 17,526 employees enrolled in the plan, with 3,992 joining for the first time. Why not check out how we’ve been helping other companies to launch new global benefits?